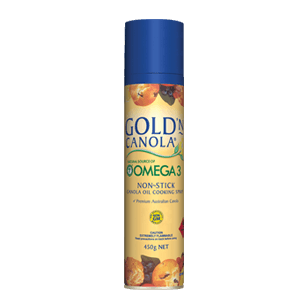 Gold’n Canola Oil Spray is a convenient non-stick cooking spray, which is also a natural source of Omega-3. It is ideal for releasing cakes, muffins and other baked products from tins. Do not store above 40°C. Ideal for releasing cakes, muffins and other baked products from tins, trays and pans. Also suitable when cooking pancakes, omelettes and pan frying.